A biogas plant can turn organic waste into readily usable gas, which can be burned as fuel. 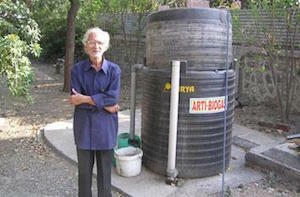 The ARTI designed biogas plant is compact and can be built on-site in just a few hours. Kitchen waste, or even organic waste found on the street can be used as feedstock for this plant. A residual effluent is produced by the plant that can be recycled into the plant with water to continue digestion. About 1 kg of dry feed a day can produce 250g of gas. Two concentric high-density polyethylene tanks allow for the digestion of the organic waste, and for the subsequent storage of the biogas. A pipe can be fitted to route the gas to a home biogas stove. Currently 700 stoves are installed in the Maharashtra State of India. Previously, many homes used manure as feedstock for biogas. The process of digesting manure though, can take up to 30 days and it highly inefficient. The ARTI biogas plant uses only organic waste matter such as waste flour, oil cake from seed pressing, and kitchen waste (rotting fruit, food scraps). This waste has higher energy content, and does not require that much time for digestion.